Ocean to mountain, deep campsites to quaint villages. Traveling Maine by RV promises fascinating times. Summer RV camping season in New England is just around the corner. Start planning! Here are ten Maine destinations you’ll want to explore by RV, roughly north to south. Aroostook Valley Trail in far north Maine winds a path from New Sweden at the northern terminus to Presque Isle at the southern end. It’s a 28-mile long gravel, multiuse trail created from a former rail bed. Expect to find deep woods, riverside stretches and brushes with five towns. RV camping can be easily found near the Trail, from dry camping at Aroostook State Park to luxury resorts such as Arndt’s Aroostook River Lodge & Campground. Maine’s capital city of Augusta beckons history-loving RVers with an eighteenth century wooden fort, a spectacular State House, the impressive Maine State Museum and nearby Waterville Opera House. Explore the Kennebec-Chaudiere International Heritage Corridor for more than two hundred miles from Bath, Maine to Quebec for the RV adventure of a lifetime. Water trails on two rivers, fascinating small towns and lush North Maine landscapes are just the start of the journey. Swan Island, on the Kennebec River at Richmond, is a nature lover’s paradise. Bring your kayak and paddle the river, or enjoy miles of hiking trails through pristine forests and meadows in search of the island’s abundant wildlife. Don’t forget to book your ferry ride in advance! Bridgton, in the Western Maine’s Lake Region, is popular with RV travelers for its vintage downtown shops, easy access to outdoor recreation and city-run Salmon Point Campground on Long Lake. Fish, paddle, hike or shop—you’ll find wonderful places to do it while camping in Bridgton. While camping in the Freeport/Durham area, consider a side trip to Bradbury Mountain State Park for a memorable mountain biking experience. Single and double track trails crisscross the mountain and the view is fine, too. The Desert of Maine in Freeport is where the kids will want to spend your Maine RV camping vacation. Located on the central coast, this forty-acre glacial desert within a forest features tram tours, hiking trails, historic buildings and an on-site RV campground. Reid State Park, on Georgetown Island, has the distinction of being one of the few places in Maine you’ll find stretches of sand beach and large sand dunes. Plan to camp on the island at Sagadahoc Bay Campground for oceanfront sites and lighthouse views. Casco Bay, by way of Portland, allows RV travelers to Maine to reach beyond the shore. Once you’ve settled in your campground in nearby Scarborough, Saco or Old Orchard Beach, make your way to Maine State Pier in Portland to go island hopping in the Bay, courtesy of Casco Bay Line ferry service. They also offer a variety of scenic bay cruises. Southern Maine Lighthouse Tour: Love lighthouses? As you leave the Portland area, you’ll enjoy views of no less than seven historic lighthouses by making stops from Cape Elizabeth to Kittery. Here’s your itinerary, driving south. Fort Williams Park in Cape Elizabeth features Portland Head Light (and museum), as well as views of the Ram Island Ledge Light from the park’s rocky beach. Two Lights State Park, down the shoreline in Cape Elizabeth, offers views of privately owned Cape Elizabeth Light. The Pier Road landing in Cape Porpoise is your next stop for views of the Goat Island Lighthouse. Sohier Park in York is a delightful spot to stroll the shoreline and enjoy views of Nubble Light. Fort Foster Park in Kittery is famous for views of both Whaleback Light and Portsmouth Harbor Light. An RV camping trip to Maine can be a different adventure every time you visit. 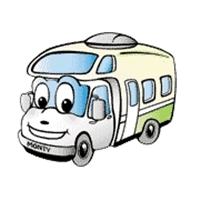 Pick your next itinerary and be sure to book an RV rental early. The Pine Tree State can’t wait to show you a good time. The fall foliage reports for Maine have indicated that right now is the ideal time to head to the North Woods and the lovely wilderness of Maine’s northernmost region. In Aroostook County you have the unique opportunity to enjoy some of the most beautiful fall colors, with between 50 and 75 percent color change at this time. It is only going to get better. What a great time to drive an RV through the county and enjoy the blazing reds, oranges, golds and yellows, as well as some outdoor recreation. This marvelous county also has more than 1,000 miles of ATV trails, so bringing your ATV along with you may be a smart move. Fishing gear is a must as well. There are thousands of lakes, ponds and streams where you can cast a line and come up with a catch. The unspoiled Allagash Wilderness Waterway invites you to take a guided canoe trip through an exciting landscape, 92 miles from start to finish. Bird watchers are always fascinated by the wide variety of feathered creatures and wildlife lovers can’t get enough of watching animal life in their native habitat. With the changing colors of autumn, your trip is all that more enjoyable. A visit to Presque Isle should be top on your list. This is the largest town in Aroostook County and provides points of interest you won’t want to miss. There is a monument honoring the first hot air balloon flight across the Atlantic which departed from here. Outdoor fun includes hunting, fishing and hiking. If you bring along a mountain bike, you’ll find plenty of trails through the forests of colorful maples. Nearby you can discover Aroostook State Park, with trout fishing, camping and much more. Try a hike on the North Peak Trail for a little over one mile of beauty, or a shorter trail to enjoy is the South Trail. Rent a kayak or canoe and fit in some paddling on Echo Lake. When you visit Caribou you will discover another spot in Maine where you may wish to stay for a while. Salmon and trout fishing is at its best here, and hiking, biking, or jogging can be a real adventure on either the Aroostook Valley Trail or the Bangor & Aroostook Trail. Learn some history by stopping by the Ashland Logging Museum. If you want to see what lived in this region millions of years ago, see the fossil and mineral specimens at the Nylander Museum of Natural History. More outdoor recreation and marvelous fall colors await you in Eagle Lake. This lake is at the south end of a whole chain of lakes where fishing for salmon and trout is a very popular activity. In the winter snowmobiling is the big thing, but in the autumn, hiking can take you through landscapes of pure beauty. Bordering Canada, the Maine town of Fort Fairfield lies along the Aroostook River with a charming atmosphere and friendly folk. It is fun to explore the Fort Fairfield Railroad Museum to learn of the railroad history of this area. Get a taste of what it was like to go to school here in the mid-1800s by visiting the McIntosh one-room schoolhouse. And of course, get out and about to witness the blazing beauty of the changing fall colors. The gateway to the North Woods is at Fort Kent. This was originally an outpost for lumbering and a region very rich in history. You will certainly find some festival going on when you arrive as they occur throughout the year. Then in Houlton travelers discover more outdoor recreation to keep them busy all day with hiking and ATV trails to explore. Browse the streets and see Victorian homes and stop at the farmers market to stock up on good food for the rest of your RV trip. In Island Falls there are four surrounding lakes where you can go boating or fishing, and you can even play golf at the 18-hole Va-Jo-Wa Golf Course surrounded by scenic views of mountains. There is nothing like a visit to Island Falls, Maine! Although the time to return home is rapidly approaching, you’ll know that this autumn vacation was certainly one of the best ever. You can always extend your stay and see the ever-changing autumn colors deepen and reach their peak quickly. Maine is a wonderful spot for an RV vacation in the fall. Picture credits: The picture of Fall Foliage in Maine is from the Wikimedia Commons. It is licensed under the Creative Commons Attribution-Share Alike 3.0 Unported license. Traveling to Maine is a pleasure in itself, with gorgeous coastal scenery and historical sites to visit. But the best destination in Maine for those who love nature is Acadia National Park. This is a park situated on beautiful islands on the coast, with hundreds of species of birds, a wide variety of wildlife and plenty of outdoor activities for the whole family. This time of year is the very best time to visit, too! You can explore the rugged coastline and the forests by taking the Park Loop Road. This is twenty-seven miles of incredible scenery and peaceful tranquility. You can then choose a park campground to stay in. There are two which accommodate RVs up to 35 feet. Or you can park your RV in Bar Harbor at Hadley’s Point Campground and enjoy the quiet location and convenience of this lovely campground. Acadia boasts some wonderful museums if you want to get some history education into your vacation. The Islesford Historical Museum is on Little Cranberry Island. This is a spot where you can learn the fascinating story of this island and its people. The Abbe Museum is in the Sieur de Monts Spring area and you won’t want to miss the exhibits there. You also don’t want to miss the main museum in downtown Bar Harbor. While in the Sieur de Monts Spring area you should stop at the Wild Gardens of Acadia. These gardens are open all year and will enthrall you with the many native species on display. The fact that it is free is an added bonus. Then head for Cadillac Mountain for some outdoor fun. This is the tallest mountain on the eastern seaboard, rising 1,530 feet above sea level and overlooking Bar Harbor. More fun awaits you in the park, with ponds and lakes for fishing and more than 120 miles of hiking trails. You will definitely want to get out into the forest. The best hikes are found on some of the carriage roads but you may want to take more strenuous trails. The Cadillac North Ridge Trail is four miles out and back and of moderate difficulty. The Cadillac South Ridge Trail is more strenuous and is 7 miles round trip. If you love to visit lighthouses, you will find Bass Harbor Head Lighthouse offers magnificent views. You’ll discover the short hiking trails close by where you can get some exercise. Mount Desert Island is a wonderful place to spend some time while at Acadia National Park. Breathe in that fresh sea air and let your imagination do the rest. Bar Harbor is nearby and is well worth a visit. Spend some time in this quaint Maine town, grab a lobster dinner and relax. Once recovered from your earlier adventures in Acadia, you may take the Bar Harbor Shore Path. This is a short hike where you’ll get some great views of the harbor and island, as well as experience what Maine is all about. This Acadia adventure gave you everything a vacation can be expected to provide – lovely scenery, a unique nature experience, historic sites and a new look at our lovely land. Come back another time for more! Picture credits: All pictures are courtesy of Travel New England. One great touring opportunity in your RV is to leave from Kittery and drive up the coast to Portland. Kittery is right between the Piscataqua River and the Atlantic, one of Maine’s oldest settlements. Enjoy the cobblestone streets, a drink at a quaint pub and marvel at the ocean views. Then take off and turn west to the Sebago Lakes Region. The drive is an awesome view of all that makes Maine a perfect vacation destination any time of year. You will want to visit the state parks to catch glimpses of fall foliage. At Wolfe’s Neck Woods State Park you will want to capture the yellow displays of the forests around Freeport with your camera, so don’t forget to bring your camera equipment. When you lay out your itinerary, be sure to put this early on the list, as the foliage peaks in mid-October. In Pownal, you must stop in Bradbury Mountain State Park for more brilliant fall colors. Explore the trails through the forests, hike to the summit and take in the surrounding beauty. A picnic may be in order. If you have your mountain bike you will find a number of shared-use trails to ride. You may have missed the peak of colors when you stop at Ferry Beach State Park but it is still worth a visit. The beaches are a wonderful place to wander. Beachcomb or simply enjoy the pounding of the surf. Glimpse the wildlife in the protected swamp areas and maybe try digging for clams. The fun never ends along the coast of Maine! The Mid-Coast region also offers vistas you won’t want to miss. Begin your tour in Brunswick and drive north along the coast. There are historic lighthouses to see, beaches and wonderful lobster dining. Head on up to Acadia National Park, a must-see while you are in this neck of the woods. Drive the 20-mile loop road through the park for spectacular views. The ocean, mountains and woods are inspiring in their beauty. You can venture to Quoddy Head State Park and find yourself at the eastern-most point of the United States. There are a number of hiking trails in this park and a diverse habitat for many rare plants. Visit the West Quoddy Head Light for a great taste of history. Go to Camden Hills State Park as one of your last stops on your Maine Coast RV adventure. More fall foliage awaits you. Drive to the top of Mt. Battie. The world is at your feet. And as you head home you will be happy with the wonderful memories of an RV vacation well taken.